Premium-quality micrograin solid carbide bit is precision ground for an extra-fine finish with maximum sharpness and edge retention. Rip and slotter bit is used for cutting sheets of laminate, paneling, and other thin material, as well as plowing narrow slots, dadoes, and grooves. 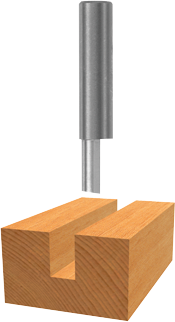 Solid carbide gives best rigidity and long life.